Majestic setting of the parts of the Mass that is scored for SATB, Solo, Brass Quartet (C-Trumpet (2), French Horn, Trombone), Flute, English Horn, Timpani, and Organ. Accessible and appropriate for any church setting. Can be used for many times throughout the liturgical year. Majestic setting of the parts of the Mass that is scored for SATB, Voice, and Organ accompaniment. Accessible and appropriate for any church setting. Can be used for many times throughout the liturgical year. 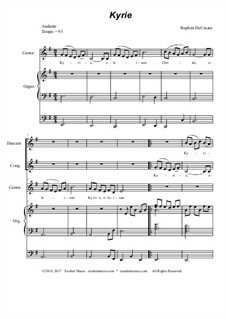 A Full score of this Mass with the parts is also available.